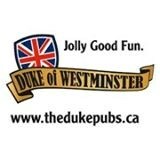 Serving tall pints and cool cocktails, the Duke of Westminster is the place to be in Toronto’s Financial District. Our majestic pub is spread across two great levels, including a 70-seat patio. The Westminster is also home to the World’s Smallest Pub, with the capacity for only eight people! Come on by – we’ve got everything you need to make the good times happen.